Machine learning powers many Google product features, from speech recognition in the Google app to Smart Reply in Inbox to search in Google Photos. While decades of experience have enabled the software industry to establish best practices for building and supporting products, doing so for services based upon machine learning introduces new and interesting challenges. Today, we announce the release of TensorFlow Serving, designed to address some of these challenges. TensorFlow Serving is a high performance, open source serving system for machine learning models, designed for production environments and optimized for TensorFlow. 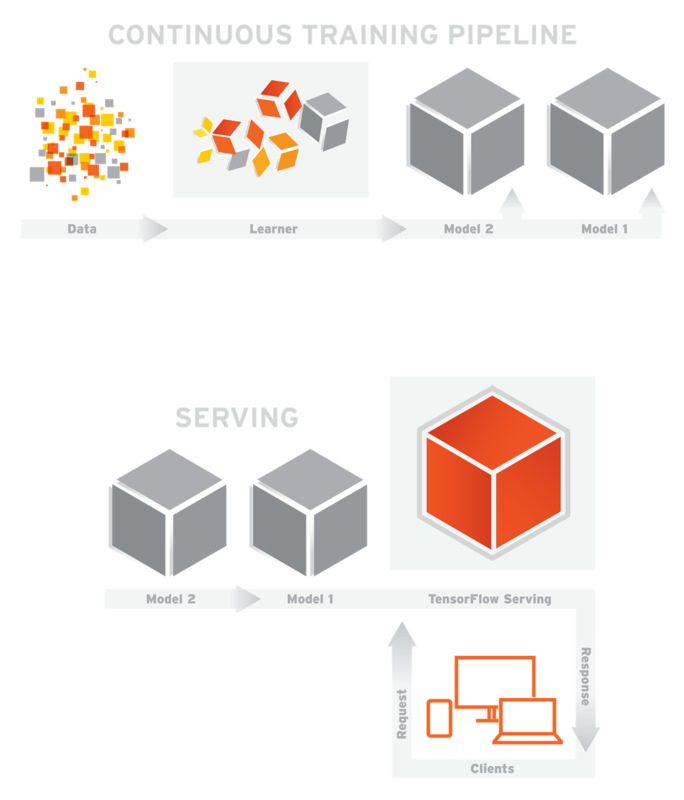 TensorFlow Serving makes the process of taking a model into production easier and faster. It allows you to safely deploy new models and run experiments while keeping the same server architecture and APIs. Out of the box it provides integration with TensorFlow, but it can be extended to serve other types of models. Once a new model version becomes available, upon validation, it is ready to be deployed to the serving system, as shown below. TensorFlow Serving uses the (previously trained) model to perform inference - predictions based on new data presented by its clients. Since clients typically communicate with the serving system using a remote procedure call (RPC) interface, TensorFlow Serving comes with a reference front-end implementation based on gRPC, a high performance, open source RPC framework from Google. It is quite common to launch and iterate on your model over time, as new data becomes available, or as you improve the model. In fact, at Google, many pipelines run continuously, producing new model versions as new data becomes available. TensorFlow Serving is written in C++ and it supports Linux. TensorFlow Serving introduces minimal overhead. In our benchmarks we recoded ~100,000 queries per second (QPS) per core on a 16 vCPU Intel Xeon E5 2.6 GHz machine, excluding gRPC and the TensorFlow inference processing time. 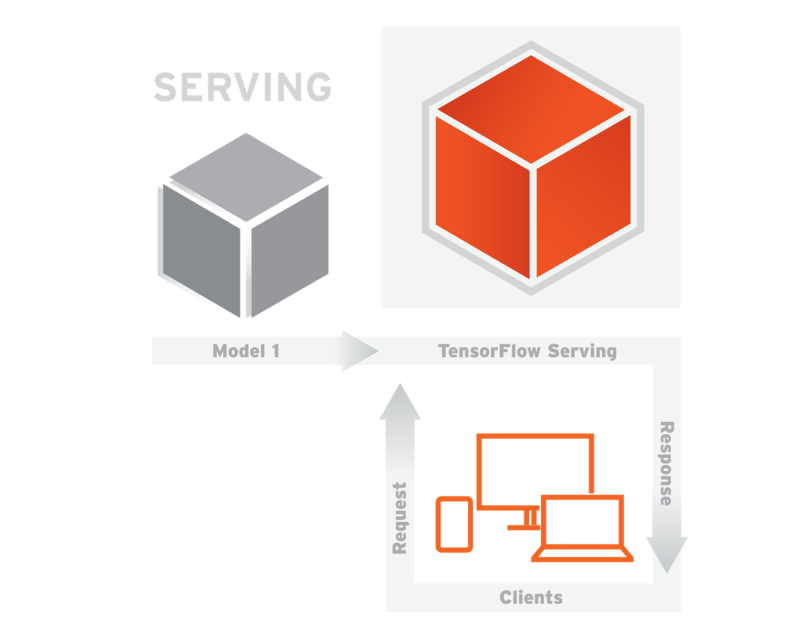 We are excited to share this important component of TensorFlow today under the Apache 2.0 open source license. We would love to hear your questions and feature requests on Stack Overflow and GitHub respectively. To get started quickly, clone the code from github.com/tensorflow/serving and check out this tutorial. You can expect to keep hearing more about TensorFlow as we continue to develop what we believe to be one of the best machine learning toolboxes in the world. If you'd like to stay up to date, follow @googleresearch or +ResearchatGoogle, and keep an eye out for Jeff Dean's keynote address at GCP Next 2016 in March.